Today is the first on a series of two sermons on STEWARDSHIP. What exactly is stewardship? A good definition for us is as follows: “The careful and responsible management of something entrusted to someone’s care.” We use the God-given gifts of our time, our talent, and our treasure to serve God through the ministry of this church, as well as through other means in our local and global community. Jesus begins this section of teaching in Mark’s gospel by pointing to a poor example of stewardship- a temple scribe. What did scribes do in first century Israel? They were competent in Mosaic law. They copied legal contracts for government officials and for citizens. They were also credited with developing the Biblical wisdom sayings in much of the book of Proverbs, along with King Solomon. This particular image of a scribe includes him wearing the tefillin upon his head, which held four sacred scriptures meant to guide the scribes as they practiced their craft. But some (not all) of the scribes had forgotten that everything they had and were came from God. They perhaps had stopped reading the passages in their tefillin boxes. Some of the scribes enjoyed their status, wearing long flowing robes, who due to their learned background were of high standing in Jewish society, and who got the best seats at temple and at social gatherings. Their prayers were for show, and they stole property from widow’s homes as they interpreted legal contracts. They were full of ostentation-pretentious display, showiness. Jesus proclaimed upon his return, “They will receive the greater condemnation.” (12:40) Jesus attacks their egotism and greed masked in the colorful robes and temple practices. This may have become a problem in the early church as well, as people began to seek roles of leadership in house churches. Jesus then contrasts this poor example of stewardship with a perfect one. First, a number of people came into Herod’s temple to pay their offerings and to support God’s work at the temple. During Jesus’ time, the inner area of the Temple contained three courts. The easternmost court was the Court of the Women, and it contained the Temple treasury where people donated their money. Three gates led into this court, one on the north, one on the south, and a third on the east. This third gate on the east side is almost certainly the "Beautiful Gate" that is mentioned in Acts 3. A fourth gate, which was much larger and ornate led from the Court of the Women west into the Court of Israel, for men only (women could proceed no further), which was elevated 15 steps higher than the Court of Women. It does not appear that there was a separate building called the temple treasury. The name was given to the thirteen brazen chests, called "trumpets," from the form of the opening into which the offerings of the temple worshippers were put. These stood in the outer court of the women. Nine chests were for the appointed money-tribute and for the sacrifice-tribute, i.e., money-gifts instead of the sacrifices; four chests for freewill-offerings for wood, incense, temple decoration, and burnt-offerings. You could say this form of financial support was quite similar to our annual line item budget! 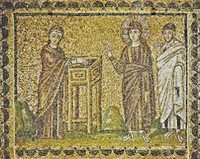 Jesus notes that in addition to the everyday offering bringer, many wealthy people were placing large sums of money into some of the chests. These wealthy temple patrons were guided by the law of the tithe(10%) and a long tradition of how to figure it. There was no paper money to speak of in those days, so no doubt when a wealthy person gave an offering to the temple, it made quite a bit of noise as the coins clinked their way down the trumpet-shaped tubes and into the chests. 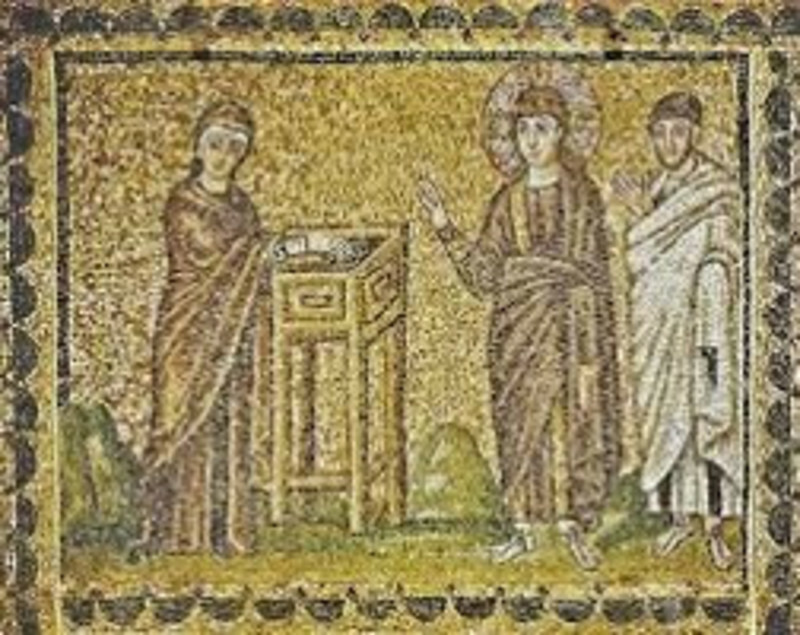 Then Jesus points out a poor widow, who puts her very small offering into the temple depository. I doubt there was much clinking to be heard for two small coins. The word “mite” is a contraction of “minute”, from the Latin “minutum”, the translation of the Greek word lepton, the very smallest bronze of copper coin (Luke 12:59 ; 21:2). Two mites made one quadrans, i.e., the fourth part of a Roman, which was in value nearly a halfpenny. Jesus sees her act and says,“Truly I say to you, this poor widow has put in more than all those who are contributing to the treasury. For they all contributed out of their abundance; but she out of her poverty has put in everything she had, her whole living.” Why would Jesus say this? Consider her status was quite uncertain, because her husband, the major source of protection and identity, was dead. Widows at that time were considered subjects of special moral concern because of their defenseless legal as well as financial position. And according to Jesus, some scribes had taken advantage of their plight and seized their homes, leaving widows and their children homeless. Her offering of 2 coins is greater than those who were putting in large sums of money to the treasury because she gave all she had, her whole living. Jesus lifts her example up as a perfect example of stewardship. What matters to God is the nature of the act of giving itself. To give all she possessed is to consign herself to potential disaster, Yet she gives freely for God’s glory and out of faith. She casts aside all conventional human securities. Her faith is in God alone, and not in wealth or status. Here Jesus contrasts any form of ostentatious, hypocritical religion with this example of faith and stewardship. Our world is so full of ostentation these days-pretentious display, showiness. So many people think they can become great in the world by the accumulation of money and goods, like those scribes who had lost their way back in Jesus’ day. My favorite example of modern-day ostentatious wealth on display? David and Jackie Siegel's attempt to build the biggest home in America, based on the palace of Versailles. David Siegel is the world’s largest property owner of timeshares. At some point, he decided, along with his wife to build this huge mansion in Orlando, Florida. If it ever gets completed, it will have10 kitchens, 23 bathrooms, a sushi bar, an indoor roller skating rink, a 20 car garage with space for limos, a grand ballroom, a two-lane bowling alley, a fitness center with spa, two tennis courts, and a full-sized baseball diamond. This palace will be 90,000 square feet of excess, which David Siegel is struggling to complete to this day. In contrast to scribes who have lost their way and ridiculously wealthy Americans building the largest home in the country, our example for today is the poor widow. The woman’s action is worthy of praise because out of her poverty and without reservation she gave her whole bank account to God’s glory. We are to follow her example of faithful stewardship, giving freely for the glory of God. A modern day example of the widow’s might- A few months ago, there was a camper parked in our parking lot. It would spend a day, maybe two parked over by Calvin Hall, and then vanish for a few days, only to return again. I was asked by a few people if someone was camping in our parking lot. I never saw anyone in the camper when I arrived in the mornings for work. So I assumed someone was parking there and must’ve had a reason. A few weeks later, I received a note, thanking me for letting the camper park in our lot. It was a note from a woman whose mother was ill and living in the apartments across the street from the church. Her camper truck was too large to be parked in the apartment parking lot, and so she had been parking in our lot and caring for her ill mother. She said it was such a blessing and really appreciated being able to park while caring for her mother. And in the note, there were 11 dollar bills. She said it was all she had at the moment, and that she wanted to support the work of a grace-filled church like ours. 11 dollars might not mean much for our annual church budget. That total is pretty close to the value of a mite. But it was “all she had,” and in Jesus’ eyes, it was a mighty amount indeed. As we all consider our pledges for the coming year for the ministry of this church, we give thanks to God for the example of the poor widow, who trusted God in faith, and who loved God with both of her mites and all of her might. May she be for us an example of how to give of our time, talent and treasure for God’s glory. Alleluia. Amen.